Years ago, I had a home alarm system. I remember that I never liked it. It was cheap, ugly, and loud with a keypad that never seemed to work right. I also recall that we paid nearly $50 a month for the privilege of someone monitoring it and we were also locked into a 3-year contract. We used it for awhile, but we soon tired of the false alarms, and the hassle of arming and disarming the system. Eventually, we just stopped using it and when the contract ran out, we didn't renew it. I later moved to a new house that didn't have an alarm system. Due to some recent break-ins in the area we decided that we might need to get a system for our new house. I scoured the Internet to try and find a Do-it-yourself-friendly system so I could avoid paying installation cost and not get locked into a multi-year contract. I ended up purchasing a 2GiG Technologies Go!Control home alarm system. It cost me about $500 but is state of the art and had a plethora of features ranging from a built-in cell radio, wireless sensors, a key fob for arming and disarming (like you use with your car), and the ability to control wireless deadbolts, and Z-wave thermostats and lights. It also had a brilliant touchscreen interface that was very intuitive. I installed the system myself and made sure everything worked OK. Now I needed an alarm service provider to monitor it. The 2GiG system is made to work with service from Alarm.com. Alarm.com does not sell service directly, you have to purchase it from an alarm monitoring service provider that resells Alarm.com's service. I signed up with the monitoring service offered by homesecuritystore.com which is the same place I purchased my alarm system kit from. Alarm.com offers several service tiers, from basic monitoring to interactive service plans that let you remotely control and monitor your system from an iPhone, Blackberry, Android, or web browser. I opted for the interactive service because I wanted to use the advanced remote control features found in the iPhone app. The service provider I chose was a pay-in-advance type. I had to pay for the entire year up front, but I was OK with this because I would only have to pay one time a year and there was no 3-year contract like my previous provider had locked me into. The price of my plan includes the cost of the cell service needed for the interactive services. The cell service itself depends on what type of cell radio you opted for when you purchased your alarm system. I chose the T-Mobile model since I know they provide excellent coverage in the area around my home. Again, you never get a T-Mobile bill for this, it's all handled by the alarm service provider and is not tied to your existing cell-provider plan. The Alarm.com advanced interactive service plan I chose allows me to use Alarm.com's free iPhone app to connect to my system and review the status of all my door and window sensors. 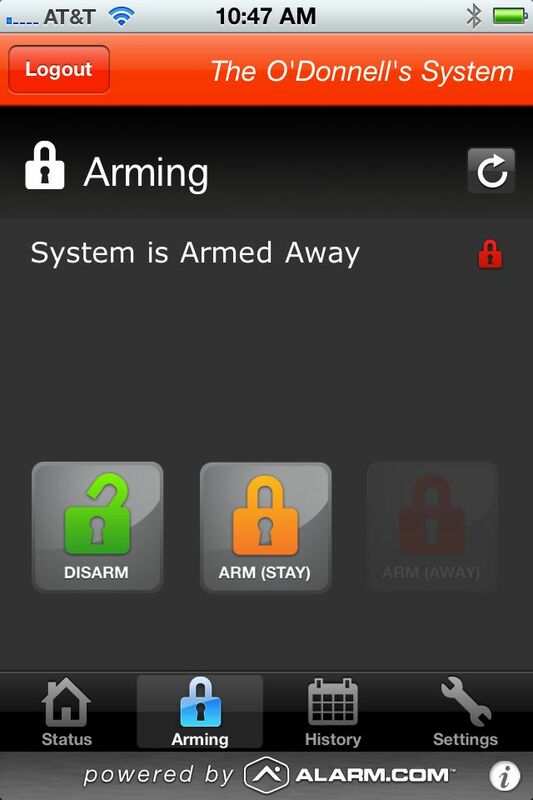 I can also arm and disarm my system directly from the app as well as look at a log of all alarm system events such as when a door is open or closed, or when the system is armed or disarmed. My plan also includes text, e-mail, and push notifications (for iPhone) so that I will immediately know if a sensor is tripped or if an alarm event occurs. You can set non-alarm notifications as well. For example, say I want to know if someone opens my backyard gate during my work hours. I can set this up on the Alarm.com website and instantly know if someone is trespassing while I'm at work. The alarm doesn't go off (although I could have it go off for this type of event if I wanted to), but at least I will know that maybe the neighbor's dog has decided to come visit. I've had the service for over 8 month now and I have to say that it has been great knowing that I have the ability to arm and disarm the system no matter where I am in the world. The text notification are also nice for knowing what's going on at the house. Alarm.com also offers some advanced features that I didn't opt for yet such as the ability to interact with and record video using IP Security Cameras. The service will let you receive video or a photo when an alarm event or notification occurs, as well as allow you to check your live camera feed. Depending on the type of alarm system you have, you can opt for another optional service alarm.com offers that will let you control Z-wave enabled appliances such as thermostats, light switches, and wireless deadbolts. I haven't purchased these options yet, but it's nice knowing that I can upgrade at any time. The iPhone app adjusts to whatever services you have. I don't see a camera option in the app because I haven't paid for that service, but if I did ,I would see it added to the app on my iPhone after I subscribed to it. Alarm.com service is available from alarm service providers nationwide. Is the Schlage LiNK a Good Home Security Option for You?